Treat that special someone to a romantic Caribbean holiday aboard the 45' sailing vessel CORUS - the perfect gift and you don't even have to wrap it! 7 fabulous nights in the beautiful and warm BVI for $6,200 all inclusive. 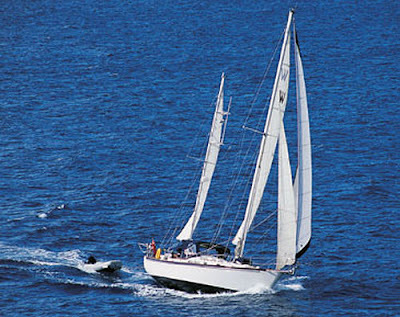 Chartering sailing yacht Corus in the BVI is a great way to learn more about sailing - hands on. Go snorkeling or scuba diving right off the boat. Or chill out on a well earned limin' kind of vacation. It is a wonderful way to celebrate a birthday or anniversary, enjoy a truly romantic honeymoon, or have a wonderful private wedding - either on the boat, on a beach, or ashore in a picturesque church. than the ones you did. So throw off the bow lines. We aim to ensure your charter vacation on sailing yacht Corus is full of lasting memories, laughter, fun, adventure and romance. We hope you make new friendships and fall in love with The Islands - perhaps to return.Every charter guest is special to us. We look after you with courtesy, consideration and professional attention to detail. In Nelson's time a yacht was described as a luxury vessel for private enjoyment - we think Corus fits the bill. She is a Ted Brewer designed Whitby cutter ketch and is named for the Greek and Roman Gods of the northwest wind. She is considered a modern classic among cruising boats: a comfortable and roomy seaworthy vessel with great stability, which makes newcomers to sailing feel confident and secure, while sailors who take the helm enjoy the thrill of a monohull as the ocean slips beneath her keel. Along with the combination of a good boat, great sailing, wonderful scenery, and fabulous food you cannot fail to have an enjoyable time here in the British Virgin Islands.The cruising itinerary is yours to choose - do as little or as much as you wish. You are, after all, on your personal private floating hotel. Wake up when you like and enjoy a leisurely breakfast, go for a dip or a snorkel in the gorgeous blue water. Later you can bay hop and beach comb or sail, sail, sail all day. Enjoy a champagne picnic on a sandy cove, kayak the shoreline or scuba dive one of the BVIs fascinating reefs or wrecks directly from the boat, under the guidance of Bill, your personal divemaster. Go ashore and take an Island tour or visit a craft center or local boutique. Hike a picturesque trail or patronize nature's own swim-up bar! Like to sample some night life and music? We can arrange that too. Finish your day with a divine dinner under a velvet canopy of stars at yet another delightful anchorage. We want you to have a fun, relaxing and memorable sailing adventure in the BVI.